Stream flow, also called discharge and indicated by the symbol Q, is determined with rating curves developed for each stream and subsequently used to calibrate flow. Stream elevation (called "stage height") is measured remotely using a pressure transducer and discharge is determined using rating curves based upon a set of cross-sectional and discrete depth in-stream velocity measurements made with a Marsh-McBirney velocity meter (other manufacturers will work also) over a range of discharge conditions. Flow, in cubic-meters/second is estimated as the average velocity of the water, in meters/sec, multiplied by the cross-sectional area of stream at that point, in square meters. We actually measure velocity at various depths and positions across the stream to estimate the true "average flow". If we do this over a range of flow conditions, from baseflow to high flow while simultaneously measuring the height of the stream, we can generate a graph relating flow to stage height. This curve is then used to convert the remotely measured stage height into flow values. Sampling intervals have been set at 15 minutes that allows more than enough time for the sensors to equilibrate between readings. Although more frequent readings are possible, the extra data is not useful for our purposes and simply use up available computer memory, add to processing time and slow the use of the data visualization tools. Flow is a fundamental property of streams that affects everything from temperature of the water and concentration of various substances in the water to the distribution of habitats and organisms throughout the stream. Low flow periods in summer allow the stream to heat up rapidly in warm weather while in the fall and winter temperatures may plummet rapidly when flow is low. Flow directly affects the amount of oxygen dissolved in the water. Higher volumes of faster moving water, especially if it creates "white water," increases the turbulent diffusion of atmospheric oxygen into the water. Low flow conditions are much less conducive to oxygenation and when water temperature is high, DO levels can become critically low. The amount of sediment and debris a stream can carry also depends on its flow since higher velocity increases stream bank and stream channel scouring and erosion, and also keeps particulate materials suspended in the water. The precipitation inputs that cause higher flows may also wash higher amounts of particulate and dissolved materials from the watershed directly into the stream. Stream flow, acting together with the downward slope (gradient), and the geology of the channel (its bottom substrate), determines the types of habitats present (pools, riffles, cascades, etc), the shape of the channel, and the composition of the stream bottom. 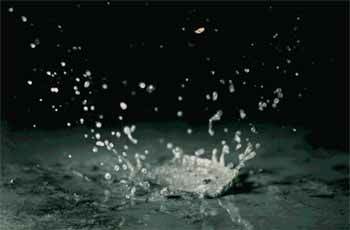 Raindrop impact. One of many types of erosion. Fig 2.13 in Stream Corridor Restoration. Principles Processes and Practices (10/98). Flow paths of water over a surface. The portion of precipitation that runs off or infilitrates to the ground water table depend s on the soil's permeability rate; surface roughness, and intensity of precipitation. Fig 2.10 in Stream Corridor Restoration. Principles Processes and Practices (10/98). The volume of stream flow is determined by many factors. Precipitation is of course the primary factor- the more rain or snowmelt, the higher the flow. However, there is usually a lag period between the time a storm reaches it highest intensity and the time the stream reaches it peak flow. This lag time is affected by land use practices in the watershed. Vegetation increases the time it takes the water to reach the stream by allowing it to slowly infiltrate into the soil before it reaches the stream. Wetlands and ponds in the watershed also add to this temporary storage. If it rains hard enough and long enough, the ground may saturate with water and then the precipitation will run off directly into the stream. In winter and spring, the potential of the natural soil and vegetation to absorb water is also affected by the depth to which it is frozen. This is why even moderate spring rainstorms may bring severe flash flooding. The precipitation also melts snow and ice that further adds to the problem. In Duluth, stream flow regimes throughout the year are typically characterized by low, or base-flow conditions that most commonly occur in summer and winter, the spring snowmelt runoff (high flow) period, and sporadic periods of storm runoff (high flow). Duluthians know better than most people about how variable these periods are and how different years can be. Because flow is such an important factor in determining the overall ecology of a stream, we have to be particularly careful about how we modify it. Because of its natural variability, we also must be careful to interpret water quality data in light of how the streams are flowing. The increased, and more variable flows associated with stormwater runoff pose a direct threat to the aquatic organisms in Duluth's streams by modifying their physical habitat. Organisms are adapted to certain ranges and intensities of water velocity. Urbanization increases impervious surfaces such as roofs, roads and parking lots that speed the delivery of water into streams. They become "flashier." Higher velocities alter habitats by moving cobbles and boulders and flushing large woody debris (snags and shoreline brush). Increased flows create secondary impacts by increasing erosion, modifying the channel and riparian zone in addition to delivering added "natural" pollutants (leaves, soil, animal droppings), road surface chemicals (metals, hydrocarbons, salts), lawn materials (grass and garden clippings, fertilizer nutrients, pesticides), and just plain litter - cigarette butts, cans, paper, and plastic bags. Increased erosion severely affects habitats by producing increased sedimentation of fine silt that fills the spaces between gravel and cobbles where aquatic invertebrates live, scours organisms and clogs their gills. Although perhaps less important in Duluth's urban streams, many streams and rivers in the U.S. have been severely impacted by flow modifications due to impoundment (creating dams) and channelization. The management of dams on the St. Louis River and some of its feeder lakes was the focus of intensive studies in the 1990's regarding effects on both habitat and water quality.